New Town is a district of Luton just south east of the town centre. It is roughly bounded by Castle Street and London Road to the west, Seymour Road to the East, New Town Street to the North, and Cutenhoe Road to the south. Castle Street was the site of a medieval castle. The district has characteristic pubs and has traditionally been a working class area of the town. To alleviate the housing shortage of the 1960s several multi-story flats were built and an industrial park was added in the 1980s to attract new industries. The ring road, which passes nearby, was created at the same time to ease traffic congestion from the M1 motorway to the ever expanding Luton Airport. New Town is part of the South ward. 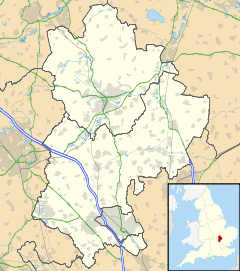 The ward forms part of the parliamentary constituency of Luton South, and the MP is Gavin Shuker (Labour). South is situated within the East of England (European Parliament constituency). ^ "Luton Facts & Trivia". Shout Luton!. Archived from the original on January 1, 2011. Retrieved 26 April 2015. This page was last edited on 12 May 2018, at 22:40 (UTC).